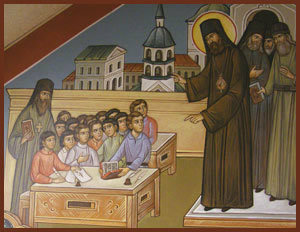 St. Innocent was the Apostle to Siberia. He was an educator and missionary bishop to the region around Irkutsk, a city located near Lake Baikal in southeastern Siberia, close to the borders of Mongolia and China. He labored there for the Lord for ten years, 1721-1731, at a time of enormous moral decadence. He had profound intellectual and spiritual gifts: the gifts of teaching, languages, preaching and guiding people to God and moral living; gifts of humility, simplicity, patience, endurance and love for all people. In a few short years he brought many people to the Orthodox Faith and vastly improved the moral and spiritual climate of the "pioneer East" of the Irkutsk region. He established schools and instructed the clergy and the people both by his words and by the power of his own example of holy living. He learned the language of the native inhabitants of the region in order to lead many of them to know and love the Lord. His devotion to serving God as a missionary to all races and classes of people in the far-off land of Siberia, and his great love and kindness to all people, endeared him to his flock as the "Holy Man of Siberia." The last ten years of his life were very different from his earlier years in urban European Russia. A priest-monk, scholar, teacher and administrator in Kiev, Moscow and St. Petersburg, he served at the best and most prestigious theological schools and cathedrals in the early eighteenth century. St. Innocent could have lived a comfortable life as an urban monk-priest-professor. 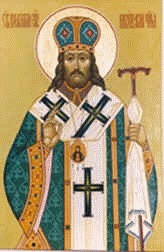 But in 1721, with the consent of Peter the Great, St. Innocent was consecrated Bishop of China. After an entire year of difficult travel, he and his companions finally reached the Chinese border, near Irkutsk. He was refused entry. He continued trying to gain permission to enter China for five years. He had to cope with many difficulties: the disappointment of not fulfilling his mission to China, and of being homeless, unemployed, without income, thousands of miles from his home. But instead of feeling sorry for himself, he accepted his suffering and trusted God, realizing that his real mission was to serve where he was, and not in China. 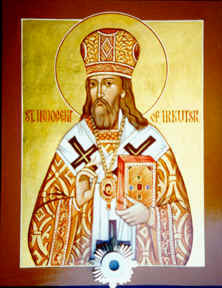 Finally, in 1727, he was appointed the first bishop of Irkutsk, in which capacity he continued his missionary work. In 1731, after only a little more than four years as bishop of Irkutsk, the saint fell asleep in the Lord, and was buried under the altar of the wooden church at the Ascension Monastery where he had lived. In 1766, when the church burned down, it was discovered that not only had the fire not harmed St. Innocent’s body, but that it had remained "incorrupt" (his flesh had not rotted and disappeared from his bones). 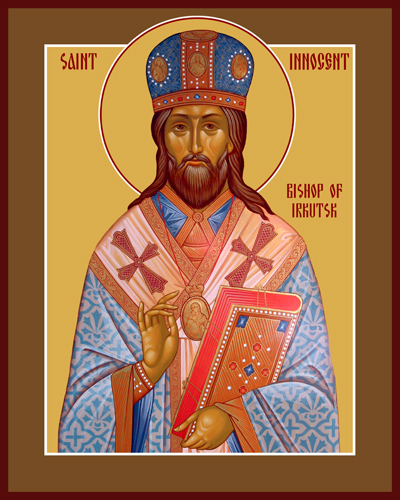 Between 1766 and 1800, so many miracles were attributed to St. Innocent, that the citizens of Irkutsk appealed to have their local saint formally and universally glorified by the Church, which was granted in 1804. In 1921 the Communists confiscated the holy relics (body) of Irkutsk’s beloved saint. Labeled only as a "Siberian mummy," his holy remains were displayed in museums until 1990, when miraculously, St. Innocent’s relics were discovered, identified, given back to the Church, and returned to the cathedral in Irkutsk on September 2, 1990, amidst great joy and weeping. Within two months after that, all of the bishop’s vestments in which the saint had been buried, plus the cross that had been in his hand, were all miraculously discovered and returned to the saint. In 1999, the full-sized reliquary containing the saint's relics (above, left), was located in the Bishop's Cathedral in the Znamensky Women's Monastery in Irkutsk, Siberia (above, center). (His relics have since been moved to a newly-rebuilt cathedral and diocesan center.) A close-up view of St. Innocent's relics is seen in the third photo (above, right). Every parish has a special relationship with the saint (or feast) to whom the temple and its people are dedicated. The Holy Spirit guides those who choose the name of the church, because within the life of the saint (or meaning of the feast) is to be found instruction and guidance for the particular ministry of each parish. The temple where all the icons of the saints in these "Saints' Lives" articles are located, is dedicated to St. Innocent of Irkutsk. We pray that as this parish approaches the conclusion of its fifth decade of existence, St. Innocent will continue to guide us, helping us to discern and fulfill our role as missionaries to people of all ethnic groups, here in the "foreign land" of Metropolitan Detroit, blossoming where we are planted. We pray that we may we be God’s instruments as He brings people to Him through us, by means of our words and the example of our own holy lives. May our patron saint help us to become more like him, and learn from his holy example. May our readers find the inspiration that God wishes to instill in their hearts and souls through the instruction and guidance of the particular saint or feast day of each reader's own parish.